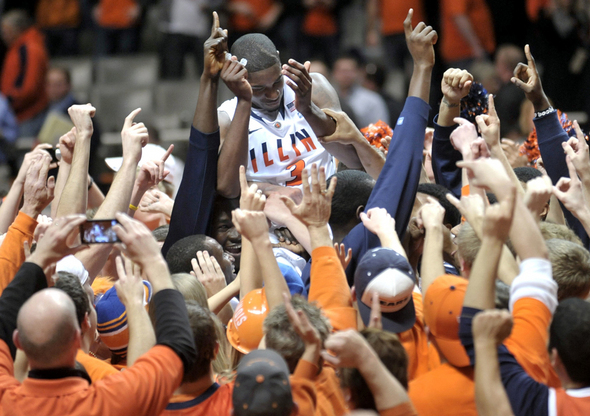 Posted on Wed, Jan 11, 2012 : 3:06 p.m.
Illinois' Brandon Paul is hoisted by teammates and fans after scoring 43 points in a 79-74 upset of Ohio State Tuesday -- a game that helped prove there are no days off in Big Ten play. So, just how good is the Big Ten right now? Overpowering? Dominating? Awe-inspiring? Or, more specifically, according to Michigan State coach Tom Izzo: "It's just scary." The conference season is less than three weeks old at this point, but it doesn't matter. The Big Ten, top to bottom, is the toughest basketball league in America this season -- and it's not close. • The Big Ten currently ranks No. 1 in the RPIratings.com rankings, the Sagarin Ratings, RealtimeRPI.com's rankings and just about every other ranking, rating, number-crunching computer program-based RPI site imaginable. • To date, four teams are ranked inside the top 13 in both major weekly polls, and six teams have spent at least one week in the rankings. • In addition, all 12 Big Ten teams entered the week with an RPI better than 150 -- the only conference to make such a claim. But what seems to make the Big Ten season so interesting is the fact that there truly are no real breather games. That's not just coach-speak, either. It's fact. After fighting off Michigan in a Top 25 battle last week, Indiana likely expected a bit of an easy time at Penn State. Not so, though, as the Nittany Lions were ready for a fist-fight -- forcing Indiana to eke out a six-point victory. The bottom of the league isn't your father's collection of basement-dwellers. Penn State thumped Purdue, Iowa has stunned Wisconsin and Minnesota has been in every one of its four early league losses. The top of the league? Well, Izzo's right -- it's scary. Before Illinois upset Ohio State on Tuesday; Michigan State, the Buckeyes, Indiana and Michigan had a combined eight losses, all of which came against a ranked opponent. The six teams responsible for those eight losses entered the week with a combined record of 82-11. As for the Illini? Well, they got 43 points from Brandon Paul against Ohio State, showing they may not be done just yet. The Big Ten tied a record with seven teams entering the NCAA Tournament last season. This season, that mark could be broken. 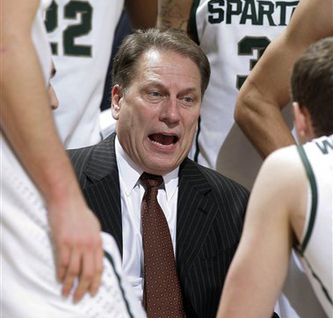 Tom Izzo gives instructions during Michigan State's 95-61 win at Iowa on Tuesday. The league's lone remaining unbeaten, the Spartans have now rattled off 15 straight wins and aren't really showing any signs of slowing down. MSU continues to blast people on the glass and Draymond Green is still a triple-threat, but the maturation of Keith Appling as a true point guard seems to be setting MSU apart. With no disrespect to Nebraska, who gets a pass for being new, the Gophers cannot seem to catch a break. Minnesota entered the week as a woeful defensive rebounding team, ranked 11th in the league. The Gophers still haven't found an answer for the injured Trevor Mbakwe, either, and likely won't. Sullinger returned to his dominant self last week for the first time since being injured, averaging 23.5 points and 10 rebounds in two lopsided OSU wins. He had 19 and 12 in a 31-point thumping of Nebraska, and 28 and 8 in a 29-point win at Iowa. 3-pointers made by Indiana during an 88-82 win at Penn State last week. The Hoosiers entered the week shooting 47.6 percent as a club. Straight losses Michigan had suffered to Wisconsin before finally snapping the skid last Sunday at home. Teams in the Big Ten that entered the week having committed 10 or fewer turnovers per game. Wisconsin (8.6), Purdue (9.9) and Northwestern (10) were No. 1, 2 and 3 nationally. Double-doubles this season by Michigan State forward Draymond Green, a Big Ten best. 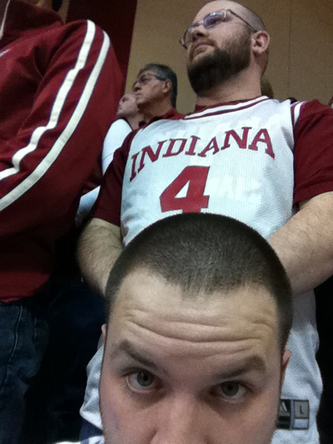 Indiana fans were up-close-and-personal with AnnArbor.com sports reporter Nick Baumgardner at Assembly Hall. If you ever get a chance to take in a game at Indiana's Assembly Hall, do so. And if you ever get a chance to sit on top of the working media, feel free to say hello. Last week's Indiana-Michigan game wasn't just a personal reminder to me just how 'back' Indiana basketball is, but also a memory of just how intense a basketball game can be in a unique environment. I set up shop for the night in the southwest corner of the arena, right next to a tunnel scoreboard. I sat on a wooden bleacher with fans standing inches from my back. My laptop was atop a wobbly table. There was no leg room. My cell got shoddy service. And I was sweating by the end of the night. The building was loud, excited, angry, passionate and overwhelmingly warm for January. In other words: It felt just right. Football season's over, folks. Hello, hoops. Thu, Jan 12, 2012 : 1:28 p.m. The proof is in the pudding, and the pudding is called the NCAA Tourney. All of this is meaningless unless the Big 10 gets multiple teams into the final rounds of the Big Dance. Wed, Jan 11, 2012 : 8:35 p.m.